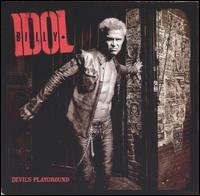 Remember the harder rocking tracks of “Rebel Yell”, “White Wedding” and “Do Not Stand (In The Shadows)”? How about the slightly mellower “Hot In The City”, “Flesh For Fantasy” and “Sweet Sixteen”? If you stuck with Billy Idol long enough you can probably even recall him stretching his musical ability with tracks from Charmed Life and the techno-inspired Cyberpunk. In the year that would see Billy celebrate his 50th birthday, the maestro of punk released his newest offering with flavors from all of the above. Age hasn’t slowed Billy down any, compiling a band to complement the talents of returning axe slinger Steve Stevens who, in my opinion, has to be one of the most unappreciated guitarists in the history of music. The diversity of musical ability can take even so-so tracks and defy you not to listen. Some of the more upbeat tracks on this disc include “Super Overdrive”, “Scream” and “Body Snatcher”, each with a distinctive sound yet all sounding like classic Billy Idol. While tracks like “Rat Race”, “Sherri” and “Romeo’s Waiting” don’t measure up to “Rebel Yell” in intensity, by no means will they put you to sleep either. If there’s truly a soft rocker on the entire album I’d say it would have to be “Summer Running” which shows flairs of the 1983 track “Dead Next Door” from the Rebel Yell album. The more I listen to this album the more I pick out moments that compare to other artists across the musical spectrum. “Evil Eye” has an updated Doors feel while “Lady Do Or Die” sounds as if it has been touched by Johnny Cash‘s musical genius. There’s even a tongue-in-cheek Christmas carol in the form of “Yellin’ At The Xmas Tree”, a la AC/DC‘s “Mistress For Christmas”. An excellent album the covers a diverse yet cohesive musical range, there really is something here for everyone, although not each track will be liked by all. At 50 years of age with over 30 years making music, this album is a high water mark that many of today’s newer bands should hope to attain. A no-brainer for the Billy Idol/Steve Stevens fan, a good bet for those returning to Billy‘s music, and a sure-fire bet to change the doubters’ minds.